Mon Bon Homme and regular blog contributor Steve Marsh needs your detective skills. 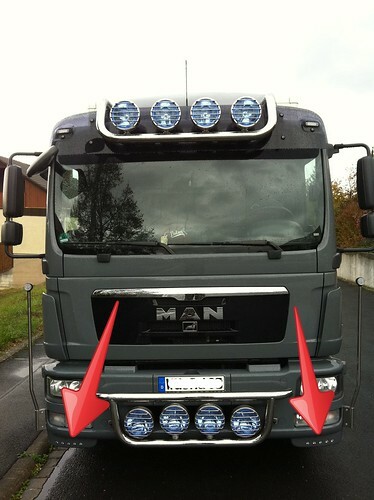 As you can see by the arrows I have attached to the photo above, this MAN TGL has some extra parts attached to the bumper, which have had LED’s fitted. Now Mr Marsh has tried to track down these parts from MAN and it turns out they are a TGM part rather than a TGL part. Marshy ordered said TGM part but they don’t fit! Can anyone help with more info?? I wondered if they are sold by an aftermarket accessory company or something. There is a German accessory supplier who are an official supplier to MAN as their brochure used to be in the MAN dealer in Colchester. MAN UK have offered much help, so Marshy will probably end up having to visit an MAN dealer next time he is in Germany. The other option is find the truck, but that will be just a touch more difficult! It’s a German MAN TGL sleeper, that makes it like a knitting needle in a hay stack. Any additional info will be much appreciated by Mr Marsh. 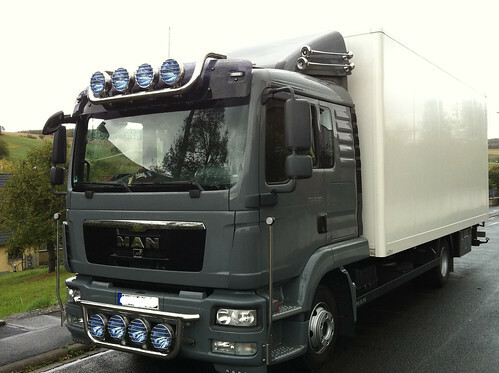 This entry was posted in MAN, Photos, Truck Detective by truckbloguk. Bookmark the permalink. If anyone reading this blog doesn’t know who John Phillips is then please leavethe building!! I preferred the Centurian to the Armstrong Steels 143. Used to seee John most evenings when tipping in Colnbrook.